Militant Jewish settlers have attacked and destroyed eight cars in Qabalan, West Bank. All were owned by local residents of the Palestinian village. Qabalan is the village next to Yatma, about one kilometre southeast. Attacks against villagers by Jewish settlers are almost four times a frequent as in privious years. The settlers scrawled ‘Price tag’ messages on cars and building, a reference to the policy of attacking Palestinians in revenge for perceived threats against the settler movement by the Israeli government. Two weeks ago residents of Qussra West Bank captured and detained a group of Price Tag attackers before turning them over to the occupation authorities. 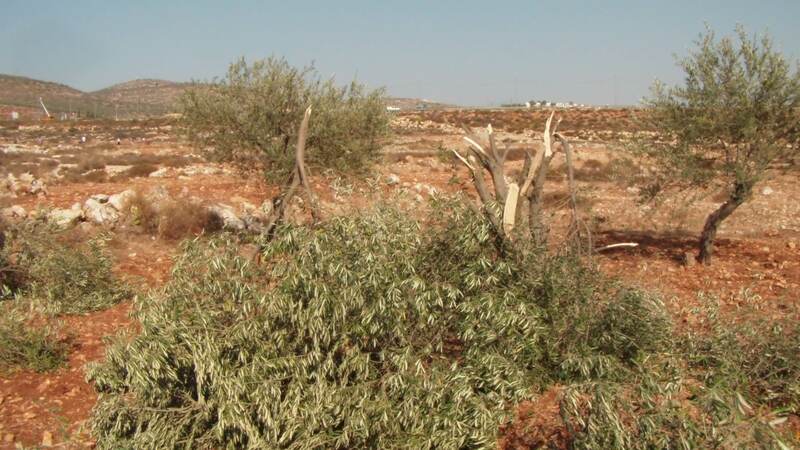 Settlers uprooted 120 olive trees at Yatma on about July 6, 2012. The olive trees belonged to Yatma resident Bade’ Nasser. The settlers are believed to come from Kefar Tappuach settlement, or possibly the ‘Taffouh’ settlement. An earlier attack on 30 trees in January was blamed on settler dissatisfaction with the forced evacuation of Jewish militants from three outposts. The ‘Price Tag’ campaign targets Palestinians in the West Bank in retaliation for actions by the Israeli government that the settlers don’t approve of. While the Israeli government claims to be against the Price Tag attacks, it generally sanctions the perpetrators only if they attack Israeli facilities. In a rare exception, Israeli occupation forces arrested the young woman in this video, for damaging Palestinian property in Luban Ash-Sharqiyia village. A photograph in this blog, shows some of the damage done to the olive trees in Yatma. This month’s attack is just the latest in a long string of attacks by settlers in the area south of Nablus. Perpetrators are rarely charged and compensation is not paid. This report compiled by the Palestine Centre for Human Rights documents some of the Israeli human rights violations in the occupied territories for the week ending 12 July 2012. Two residents of Yatma were arrested this week, while passing through an occupation checkpoint between the villages of Yatma and Osreen. There hasn’t been any news why the two were arrested, or whether they were charged. A number of other Palestinians were arrested by occupation forces this week. This follows a curfew in Yatma in late December, after settlers from the nearby Rechalim settlement claimed that armed men had fired on settlers. Residents of Yatma were locked down, but no evidence of gunfire was found. It isn’t clear whether the settlers were correct, or whether they were harrassing the residents of Yatma intentionally. Conflicts between settlers and residents are common in the area, but there have been relatively few incidents between Yatma and Rechalim since the ‘Price Tag’ attacks on Yatma a few years ago.